WHAT’S AN EVP? This acronym is a litmus test. If you work in or around employer branding, however tangentially, you’re likely to have a strong view about it. If you don’t, if you’re from a marketing idea, you probably won’t. So read this first. But as I said in my last podcast, for a variety of reasons ranging from brands becoming increasingly social and transparent, consumers with ever-greater senses of service entitlement and a millennial generation focused on IWWIWWIWI (I want what I want when I want it) satisfaction, employer branding is one of the fastest growing areas of impact in modern marketing. And this acronym is on its way to the marketing acronym hall of fame, right up there next to CMP and PPC and just behind the 4Ps, 4Cs (or 5Ps or 7Ps) that make up the classic marketing mix. So what is EVP? It stands for “employer value proposition” (sometimes, “employee value proposition,” though this is illogical and wrong). But what does it mean? That’s where things get interesting. I recently argued that the employer brand was an extension of the master brand into the talent marketplace. The proper definition’s a bit more complex, but for our purposes here this will do, because it illuminates the right analogy: if the employer brand is an extension of the master brand, the EVP should be an extension of some element of the employer brand. But an extension of what, precisely? Something vaguely connected to/derived from the company’s mission, vision, values or purpose. While all of these make sense as part of the brand’s architecture, we can eliminate two quite easily. While the word “value” might suggest mission, vision and values, this doesn’t align with the primary purpose of a brand. As I’ve observed, brands exist to make people take selective action. On their face, values statements appear to have a similar purpose: they exist to help you understand what to do and what not to do within the framework of an organization to which you already belong. This is why values statements include anodyne words like, “honesty” “integrity,” “purpose.” They exist to help the institutional reader re-establish a conceptual “true North” in moments of doubt. But brands serve a very different purpose; they exist to create desire. The selective action you take is the the action the brand predisposes you to select, generally from a wide field of choices. So the EVP clearly can’t come from mission, vision or values. One could make a similar argument by analogy for the EVP as the brand essence…but this also falls apart. When it’s silent, the purpose of the essence is to distill down the brand platform to a memorable truth. For example, Nike’s brand essence of “everyone’s an athlete” (which they helpfully call a “mission statement” now) helps the brand keep messaging aligned with this core idea but it’s not something we see pointed at us as consumers. The employee value proposition promises us in its last word that it’s a proposition—something we’ll see, hear, understand out loud. The remaining options are both contenders. The EVP could be a strapline or tagline or a USP because a strong strapline is generally strong because it’s memorable and because it underscores the USP; similarly, a good USP is an expression of a brand’s most important (or most unique) differentiator. But logically, the EVP is clearly an extension of the concept of the USP into the talent arena while the tagline/brandline/strapline just refers to a particular use of that idea, namely in lockup with the brand’s logo. But there’s a simpler way to think of the EVP. Think of it as the handprint of your brand. Not only do we all have different hands, but they’re all differently skilled. And those skills are a physical, tangible expression of what we’ve made ourselves good at. 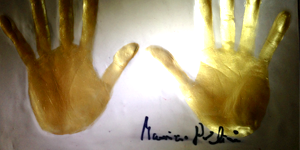 The photo at the start of this article, for example, is of the handprint of pianist Maurizio Pollini. You can see his hands are big, his fingers are long. That’s part of what made his career as one of the world’s top piano virtuosi possible. We’d imagine Michelangelo’s hands would be different. And Serena Williams‘ hands we can see are different still. Each are visibly shaped by what they do. Each make their occupation, their mark on the world, possible. A great EVP: same. Crafting a strong EVP is not particularly easy, but it’s straightforward. My colleague Cate Newsom wrote an excellent piece about developing an evidence base for your brand in which she described a research process specific to the master brand but the same logic applies with the employer brand. A strong employer brand position must be clear, relevant, resonant and differentiating in order to provide the energy to make one want to act. In the opening line of Anna Karenina, Tolstoy famously observes, “happy families are all alike; every unhappy family is unhappy in its own way.” This applies equally well to the employment relationship. Ask most employees of most good companies why they love where they work and they’ll say things like, “The company is innovative.” “My colleagues are like family.” “We value integrity.” “We treat each other with respect.” And so on. But when it comes to differentiators, what appears to differentiate often doesn’t, and what does, often doesn’t resonate. For example, every tech company we know prides itself on innovation. And yet, none of them uniquely “own” innovation. It’s important to everyone. So companies that try to differentiate around innovation end up talking about measures of innovation like numbers of PhDs on staff, patents issued, products launched, consumer demand, etc. Similarly, where there are strong differences, such as a desirable location or a great benefits package, employers also fumble the ball. The challenge here isn’t that these organizations lack smart people or that the talent they seek to attract isn’t willing to focus on issues that need careful branding (benefits, I’m looking at you). It’s that they typically want to brand what we might call their “moral virtues,” not their differentiators. Put another way, asked to speak about itself, an organization will typically want to speak to the world about what it likes about itself, not what’s unique about it. Why? Because it generally doesn’t know any better. Just as we rely on the kind honesty of others to increase our own self-awareness, most organizations need some form of outside help to see themselves as they are. In our experience, this “help” comes from four distinct sources: external perspective, employee perspective, provincial perspective, and expert observation. External perspective is the perspective of a specific segment of the workforce outside the client organization. Getting it requires recruiting the kinds of people the organization would hire if it could and understanding what they think about when they think about the client organization. It’s expensive, but it’s essential to understanding what’s a real differentiator as distinct from an industry given (the “moral virtues” I mentioned earlier, e.g., innovation for tech, caring for healthcare, liking people for hospitality). The right “outsiders”—industry experts who understand essential job requirements but haven’t drunk the Kool-Aid—provide a clear-eyed view of both the organization’s competitive strengths. If you’re lucky, they can also highlight unique equities insiders have forgotten (or never learned) to value. They know the company and they’re not distracted by things that don’t matter. For example, we recently did a project for an innovative, flat and results-based tech company. During external focus groups in China we heard many employees of other companies talk about the risk of ending up with the wrong boss or work team. While this is broadly true in tech in China, our internal work helped us understand that it simply didn’t apply to the company that had hired us. They know what’s coming. Often what differentiates turns out not to be a generality (e.g., “innovation”) but a specific kind of applied innovation (e.g., “atom engineering”). Employees are naturally excited about what’s coming but often don’t have either the messaging skill or the opportunity to shape the message. They know their customers. Even if they never interact with customers directly, most employees are close to the specs that customers evaluate the company on. And more importantly, as a result, they know the unique satisfactions of specialized tasks or interactions that enable customer success. Many great brands have an equity called provenience, a “place-ness” that shapes how we understand them. (This equity is also called “terrior” by some but I prefer provenience.) Not surprisingly, this equity is at play in multi-national employer brands as well. On one hand, consumers expect brands to stay “true to their roots” (consider the phrase). On the other, employees live and work in a particular place within a particular socio-economic context that invariably affects their understanding of the “covenant” between themselves, their local operation and their parent company’s home territory. Understanding how local equities affect the organization’s offering and in turn, how the organization’s own provenience affects the corporate view of a given location provides essential context for developing the global EVP and localizing the equities that support it. Focus groups are the traditional way to gather insight into external, internal and provincial perspectives but they’re often insufficient. We’ve delivered our best results when the insights we’ve gathered from internal and external groups are supplemented with both onsite and offsite observation. The onsite part of the journey might include sitting in an employee cafeteria in Beijing or touring the smoking facilities in Dubai. The offsite part might include walking the streets of Singapore looking for fresh durian or navigating rush hour traffic in Bangalore. What’s important to the work is that the external perspective understands nothing as a given. “Small” things like bad cafeteria food, segregated smoking rooms that feel like prisons in a culture where smoking is still an important activity, necessary staples being far away from worksites or impossible commutes actually matter a great deal in the lives of workers. But once current employees have made their peace with them, you won’t hear about them while external talent won’t think to explain things like the facts of traffic patterns to you. They must be directly observed and experienced. That fact leads to a larger idea, one that’s at the heart of what makes a good EVP. In crafting the EVP, differentiation is essential but the larger goal is always the same: to understand the work—and therefore, the real value of the EVP—in the context of the lives of the people to whom it has to matter. This is an important distinction between the employer brand and the master brand. As I pointed out in my last post, the employer brand isn’t a transaction—it’s a long-term commitment. So what matters most in creating a strong EVP is not whether it succeeds in getting a quick hire; it’s whether that hire is joining the organization for the right reasons. What are the right reasons? It depends, of course, but in general, they support a long-term covenant between the organization (or employer) and the new hire. The purpose of the EVP is to succinctly express the clear, differentiated essence of that covenant.